Indoor cycling instructors do what we do for many great reasons. General fitness, improved mood, and good, clean (yet sweaty) fun are just a few. But the benefits of an indoor cycling session to certain people may go beyond what you think. It’s estimated that over 10 million people currently live with Parkinson’s Disease. Although there is still no cure, more People with Parkinson’s (PwP) than ever are using specialized exercise programs to help delay or reverse their symptoms. Regular readers of ICA may be familiar with the amazing work being done using indoor cycling sessions specifically tailored for PwP. This ICA article by Bill Roach called A New Benefit of Indoor Cycling for People With Parkinson’s introduced the concept superbly. Although many PwP have benefited from these existing programs, there are many others who don’t live near a facility that offers the specialized class or can’t make the classes due to scheduling difficulties. While a mainstream indoor cycling class provides many benefits, the specialized forced-rate exercise that was found to be most effective in the Cleveland Clinic’s research is not typically part of most cycling classes. As the creator of MyFitnessDJ, an app that helps indoor cycling instructors plan and play classes, I wanted to help more PwP use indoor cycling to reduce their symptoms and increase their quality of life. By utilizing an existing code base, doing a fair amount of research and interviews, and taking advantage of Apple’s Movement Disorder API for Apple Watch, I introduced an app specifically targeting PwP that is called Cue My Ride. 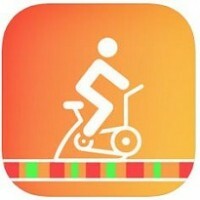 Cue My Ride runs on an iPhone to guide an indoor cycling ride that’s tailored to help Parkinson’s symptoms and uses the Apple Watch to monitor those symptoms before and after the ride. It not only encourages exercise that can help reduce Parkinson’s symptoms, but also provides a tool to measure how the symptoms change as a result of the exercise. Tremors and Parkinson’s-specific dyskinesia from two hours before and two hours after each ride are quantified and compared to help a rider better understand which specific profile type helps their symptoms the most. During the ride, Bluetooth data is transmitted from the bike to an iPhone. This data—specific to that rider on that bike on that day—is used to guide an intensity that is challenging but manageable and to guide the cadence to reach the precise forced-rate frequency that’s effective for PwP yet avoids an unsafe or unproductively quick cadence. The ride is guided with text and vocal and color-coded cues that are accessible to new riders and effective for experienced riders. Cue My Ride meets the rider where they are, regardless of cycling experience or ability, and helps them find their place of challenge and change. This is particularly important for PwP, as physical strength and stamina can vary widely from day to day. Orange points represent a potential endorphin response, which typically relates to the feeling of being energized yet calm after workouts. Red points represent a potential dopamine response; this is what makes us feel crazy happy when we’ve completed a challenging workout. And for people with Parkinson’s, the dopamine response is even more important. End-of-ride report options can be shared immediately or saved for later. An easy-to-read chart summarizes data for the last five rides. It includes tremor and Parkinson’s-specific dyskinesia before and after the ride, comparison calculations (whether your average symptoms went up/down or stayed the same), and the points you accumulated in each of the three categories. This summary graph helps a rider determine which ride type yields their best results. Riders can also share or save a data file (type .csv that can be opened in any spreadsheet) containing all ride and movement-disorder data for those who want more specific information or want to share detailed data with a care provider. The primary market for Cue My Ride is individuals who have been diagnosed with Parkinson’s disease and whose doctors have approved a forced-rate indoor cycling program for them. Although targeted to individual riders, more than one Bluetooth-enabled bike can be paired to an iPhone, which means a small group ride is possible and loads of fun! The public release of Cue My Ride gives PwP an opportunity to try the forced-rate exercise method to see how effective it is for them. Symptoms of Parkinson’s disease are as diverse as the affected population, so giving as many PwP as possible the opportunity to try a treatment option is really important. Cue My Ride puts this opportunity directly into the hands of those who can benefit from it. I’m really proud of this effort and hope it not only encourages PwP to ride and move and feel great, but also provides a new tool to measure symptoms and tailor exercise to be most effective for many people living with Parkinson’s disease. This is so great! If I share this on my YMCA site ( we do offer PwP rides), will the general population be able to read the full article without being an ICA subscriber?